of professional service to the bride and groom. 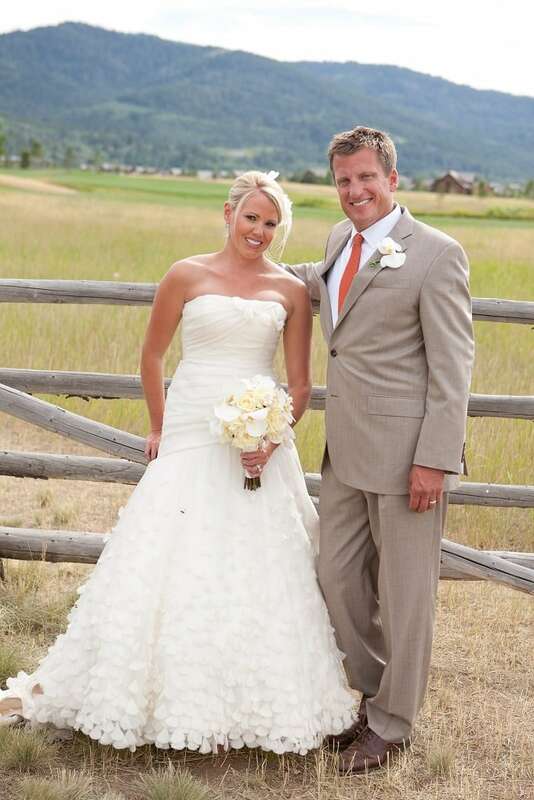 It’s difficult to imagine a more spectacular setting for a wedding than Teton Springs Resort! Brides and grooms from across the country have chosen this year-round destination resort to host their most special day. 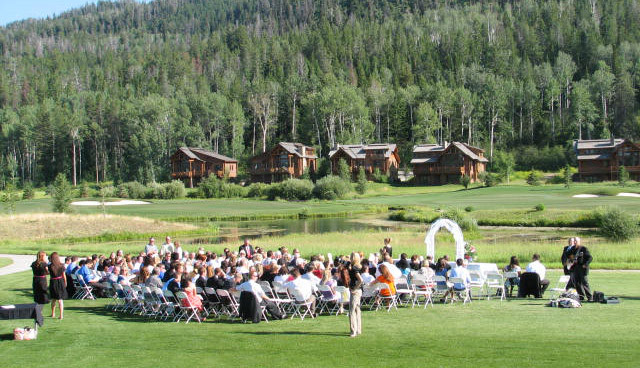 Set in the heart of idyllic Teton Valley, Idaho, Teton Springs is surrounded by the majestic Teton and Big Hole Mountains, and the Caribou-Targhee National Forest, providing a unique and breathtaking backdrop for a wedding ceremony. You will have total peace of mind as our friendly and competent staff takes care of every wedding detail. We offer all the services you would expect in a destination resort: Gourmet Catering, First Class On-Site Lodging in one of the Lodge’s 52 casually elegant rooms/suites or 3,4 and 5-bedroom luxury mountain log homes, Fine Dining, and Full-Service Spa. The Stillwaters Spa & Salon specializes in providing all pre-wedding services and treatments for the entire wedding party. We’ll also assist in scheduling a variety of Activities for you and your guests to enjoy in this glorious Yellowstone-Teton region. We welcome wedding ceremonies, receptions, rehearsal dinners and social events for your families and guests, for as few as 20 people to as many as 120 guests. And, dependent on event format and the time of year, larger groups can also be accommodated. Outdoor venues include: Headwaters Park, adjacent to the Lodge & Spa, Caddis Lake, a large area of manicured grass adjacent to the golf course offering inspiring views of the lake and mountains, and the Rammel Barn, a historic barn on property that has proven to be the optimum picturesque site for weddings. Winter weddings can be held in the Snake River Room and also the beautiful Headwaters Grille for smaller, intimate functions. You and your guests will discover unparalleled adventures while you’re here. A sampling includes: whitewater rafting, hiking, world class fishing, horseback riding, hot-air ballooning and Wildlife Safaris through Grand Teton and Yellowstone National Parks. Family fun tournaments can also be scheduled on the Byron Nelson Par 3 golf course and the nationally recognized Headwaters Club offers 18 holes of exceptional golf. For more information, contact Hannah Brubaker by phone at (208) 787-7277 or by email at hbrubaker@tetonspringslodge.com.